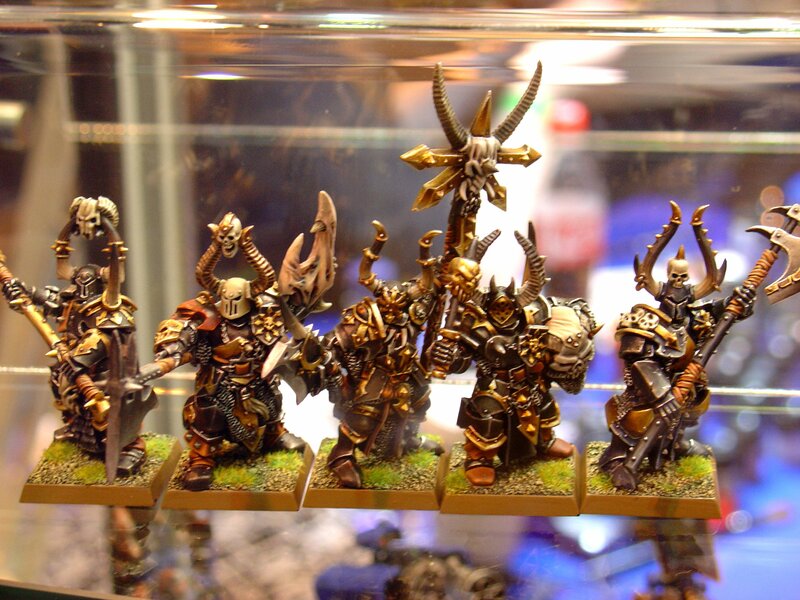 Probable Things | a blog by small_furry_spider, with a slight focus on wargaming…. Well, it has been a long time since I posted, but 2 children under the age of 3 will do that to you. Anyway, since GW shut the local battle bunker down, my gaming has been a bit like my posting here and some of us have got fed up enough with this to do something about it and start our own club. Welcome to Sons of War. 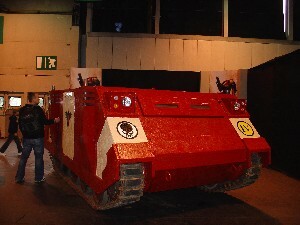 We are a new wargaming club based in Cambridge, UK. We will soon be affiliated with the GCN, but welcome anyone who wants to play games from Warhammer 40k and Warmachine to board games and RPGs. 7 of which are full 6â€²x4â€² tablesâ€¦ eager and willing for you to spill 40k blood onto..
As I guess most people know, Games Workshop has stated that the new Space Hulk will be a one time limited release and that there will be no expansions or any extra bits. I was a bit surprised about this decision, but I got the chance to ask Jervis Johnson about it at the UK Games Day. I will quickly paraphrase our conversation. Basically, GW don’t want to add any more games to their core line up (40K, warhammer and LotR) but still want to be able to release great “stuff” that does not quite fit in with this mission statement. By making it limited edition they can make stuff like Space Hulk and not be tied to ongoing support- everyone understands what this means and won’t expect any content. The card pieces are also really expensive- so I guess the profit margin on this is not that great. I got the feeling (although he did not say so directly) that this would be the only way they could release stuff that did not fit in with their core games- maybe a compromise between the games designers and upper management? Interestingly, Jervis said they may do more stuff like this in future, which would only be good. How will specialist games fit into this paradigm? I don’t know, but some of them are virtually unsupported anyway. Any thoughts? Choosing high elf magic weapons. High Elves have a great selection of magic items in most categories. 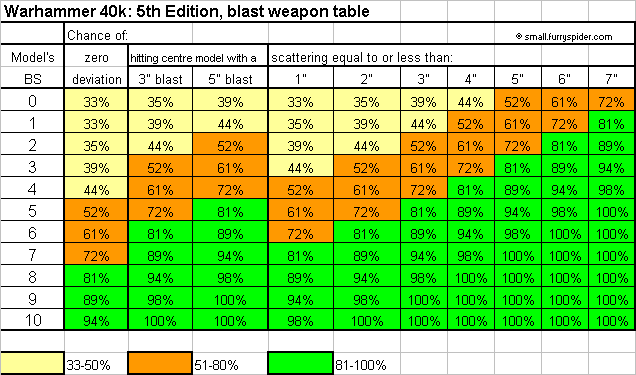 However, I find the close combat magic weapon options quite disappointing.Â Some of them have very similar functions and others are just not better than other options for less points.Â Crunching some numbers for the weapons is quite instructive. 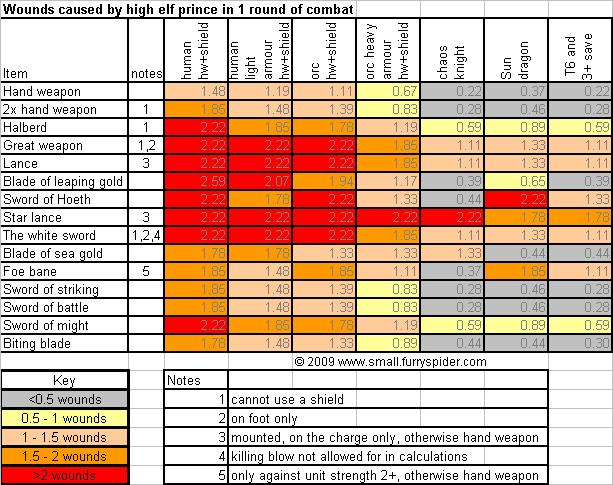 The table below shows the effectiveness of a high elf prince in one round of combat against a variety of foes (they all assume a higher WS than the opponent). At the top of the table are all the mundane weapon options for comparison- they can all be magic with the amulet of light if ethereal/wood elf targets are likely. Initially it looks a bit confusing, but if you remember that the more red the better, and light and squishy on the left and big and gribbly on the right. You can easily see that the Blade of leaping gold is good against light infantry but pretty awful against anything tougher.Â I will broadly categorise the weapons into the good, the bad and the ugly. 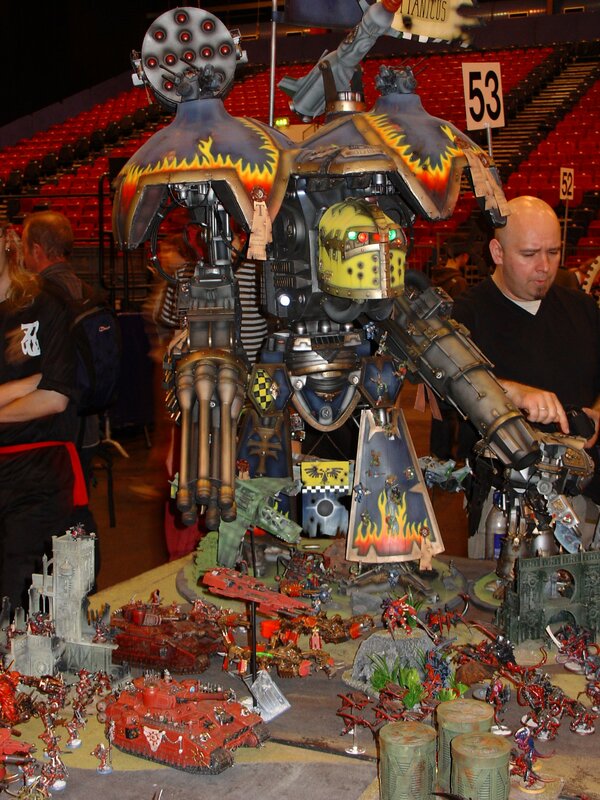 UK Gamesday 2008, thousands of wargamers, loads of games, and a fair bit of new and interesting stuff from GamesWorkshop…..
Trolls and other monsters will be available again, along with a new “warÂ altar”. The eye of the Gods table. Heros who kill a champion in a challenge, chosen, trolls which regenerate 2+ wounds in a single phase etc get to roll on a table (2d6) with a range of boosts. 1 in 36 to be stupid, 1 in 6 to get ignored, all the rest are boosts, from +1 S/T/Ld all the way up to cause terror and stubborn with a 4+ ward save and last for the whole game. 3 new magics spell lists, including a spell cast on a 15+ which causes 2d6 hits at strength 2d6, and if you roll 11 or 12 for strength, the whole unit disappears…. the chance of scattering less than or equal to a given distance. and how it changes with the model’s BS. The colours denote a 33-50%Â (yellow), 51-80% (orange) and 81%+Â (green) chance of meeting the criteria. The numbers are much better than I thought- it seems that my fire prism is still quite effective. If you find this useful, let me know (or if you find any mistakes!). Again, if you happen to read this and notice something is a bit odd, let me know. It does not seem so long since 4th Edition, but 5th is now just around the corner. GW have a preview on their site and there are copies in stores which the managers may let you look at. Then there is the question about which version to get. GW seem to have realised that there is a market for a range of different editions- I am tempted by the collectors edition, but then I would need a second copy to play with, and I just can’t justify that. Rumour also states that there will not be a full mini rulebook- I bought macragge (from ebay…) just so I did not need to carry the big one around. The gamers edition looks nice too, but I probably don’t really need an ammo crate. I may just end up with the basic book. How effective are Warp Spiders? The move to 4th edition has only really improved Warp Spiders- they can be very effective, but don’t let that marine armour save fool you, they are fragile and quite expensive. As you might have guessed by now, I am going to use some maths to choose the most efficient options for a squad. While maths cannot replace tactics, it should give you some idea of how to optimise your choices to get the most out of a very versatile unit.